For Shaker enthusiasts who want to assert their individuality, the Shaker Autumn Dining Chair has a slightly different take on the classic design. We’ve set the chair back directly into the seat, rounded the arms, redistributed the chair rungs and shortened the finials! Shown here are just a few examples of the craft and care that go into every piece. Hundreds of meticulous acts assure that solid hardwood is transformed into solid furniture, so durable it lasts a lifetime. So the real beauty is, the beauty lasts. Chair Quality Features . . . Leveled Chair Leg. A precision-engineered saw cuts all four legs for a perfectly level chair. Finger Joining. Each corner of this chair is permanently fused together by finger joining, a unique glue, one lag anchor and two screws. Mortise & Tenon. 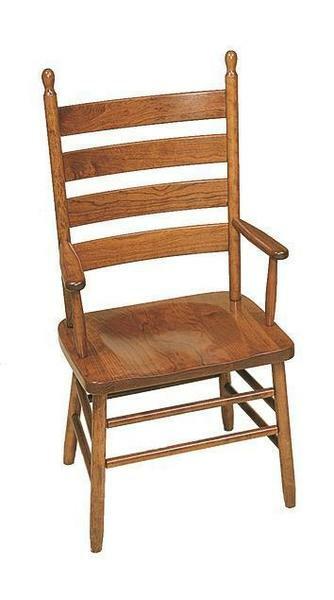 Most of our chairs utilize mortise and tenon joinery for tremendous strength and durability. Steam Bending. 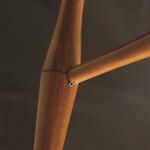 Our steam-bent hardwood parts provide style and beauty. Saddle Scoop. Provides optimal seating comfort. Seat Height - 17 ¾"
Seat Depth - 18 ½"
Arm Width - 16 ¾"
Arm Height - 25 ¾"